"Conjuring up images of the other-worldly northern lights by virtue of its name, Aurora Musicalis is a piano trio that evoked the musical equivalent of awe and surprise in a wonderfully varied and illuminating program." 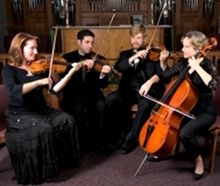 "The Triangle is fortunate to have so many superb chamber music ensembles performing in the Triangle. One of the very best is Aurora Musicalis, which played a most exciting program this week at Meredith College’s Carswell Concert Hall. Particularly moving were the tonal splendor of the strings and masterful playing of all the performers." "The performance given in Bosendorfer Hall was outstanding in every respect, bringing a program that often seemed full of longing for the past full circle. It was a wonderful opportunity for the public to hear a seasoned ensemble whose members think and even breathe together play music they clearly adore."